While every Subaru vehicle comes generously equipped, you can tailor yours to meet your life and your style with a wide selection of Genuine Subaru accessories. Enhance performance and utility or just give your ride some extra personality with add-ons that can help you carry greater amounts of necessities and accomplish more with every trip! Each accessory is designed to provide the same fit and quality as your Subaru vehicle, ensuring every new component fits and functions just like original equipment. Genuine Subaru accessories are also engineered to maintain your vehicle's safety ratings and warranty. Plus everything installed at your Gemini Motors during vehicle purchase is covered for three years or 60,000 km. With competitor accessories... well, your guess is as good as ours. Whether you're looking to enhance your vehicle's multimedia and convenience features or customize your vehicle's exterior, all Genuine Subaru accessories are specifically designed to fit your Subaru and nothing else, so the workmanship is unparalleled. 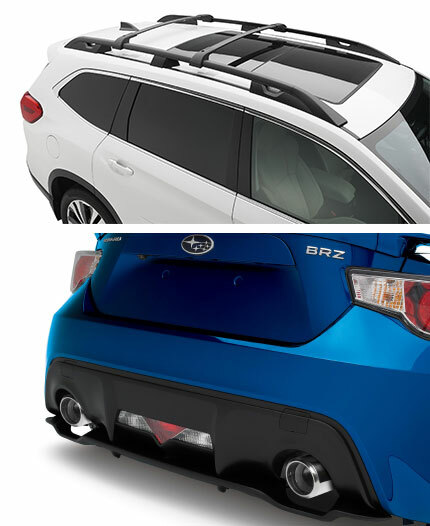 Genuine Subaru Accessories are engineered to work with the vehicle's crumple zones, bumpers and body panels. Take the Forester's trailer hitch as an example: this aftermarket accessory replaces the bumper beam in order to maintain Forester's top notch safety rating, providing peace of mind by incorporating Subaru's high safety standards right into the design. Genuine Subaru Accessories installed at your Gemini Motors at the time of vehicle purchase are covered by Subaru's comprehensive warranty, offering you the highest possible level of quality and reliability.